Happy Easter from your friends at HamletHub! : Happy Easter from your friends at HamletHub! May your Sunday be filled with joy, hope, love, and laughter! 15th Annual Mother's Day Luncheon Benefiting the Molly Ann Tango Foundation Planned for May 10: You are invited to attend the 15th Annual Mother's Day Luncheon on Friday, May 10 at Le Chateau in South Salem. "Our biggest fundraiser of the year. There will be pink champagne, a served lunch, silent auction and lots of surprises!" G. Richard Mahland, 76, of Ridgefield, has Died: G. Richard Mahland, 76, of Ridgefield, passed away on Friday, April 19, 2019. He was the loving husband of Mrs. Michele (Wireback) Mahland. Funeral arrangements are incomplete and will be announced by Kane Funeral Home, Ridgefield. Do you know the history of your antique Ridgefield home? 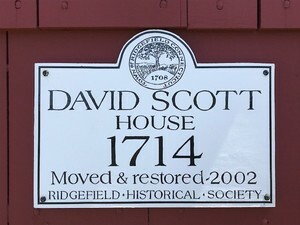 The Ridgefield Historical Society has information on the more than 600+ properties that are listed in the Architectural Historic Resources Inventory of the town. Historic House Plaques may be ordered as gifts: they are weatherproof, handmade, and come in two sizes (10” x 14” and 12” x 16”), featuring the town seal along with text and the circa date of the building. Order now in time for the holidays! Turnaround time is approximately three weeks. Purchase of a plaque in no way limits your right to make alterations to your building in the future.